NZSki.com, NZone Skydive, Skyline Queenstown, Ultimate Hikes, Over The Top Helicopters, Highview Apartments, Helitours, Shotover Lodge, Touch of Spice, Bill Richardson's Transport World, Destination Queenstown, Destination Fiordland, G Force Paragliding, Southern Discoveries, Heritage Hotel Queenstown, Te Anau Holiday Houses, Wanaka Kiwi Holiday Park, Glacier Southern Lakes Helicopters, Murrells' Grand View House, Rosco's Milford Sea Kayaks, Southern Lakes Helicopters, Luxmore Jet, Fiordland Helicopters, Te Anau Holiday Park, Kiwi Haka, Otago Museum, Te Ana Rock Art, Heliworks Queenstown Helicopters, Wanaka River Journeys, Alpine Springs, Guided Walks New Zealand, Highride Adventures, U-Fly Limited, Art Adventures, Hermitage Hotel, Mt Cook Ski Planes, Alpine Guides, Southern Aqua Adventures, Best Western Cranbury Court Apartments, Birchwood Manor Motel, Hot Pools Omarama, Body Sanctum Spa, Milford Sound Lodge, Prospect Lodge, Fiordland Cinema, Wanaka Lakehouse, Outside Sports, Break One Clay Target Shooting, Highride Adventures, Quality Hotel Cargills, Elm Wildlife Tours, Dunedin International Airport, Orokonui Eco Santuary, In2Food, Highland Helicopters, Garden Motel, Chalet Queenstown, Trips & Tramps, Arrowfield Apartments, Chalet Queenstown, La Toscana, Marakura, Millers Flat Holiday Park, Fiordland National Park Lodge, Bottom Bus, First Light Travel, Quietlight Photography Tours, The Lodge at Walter Peak Station, Fiordland Outdoors Company, Hunter Valley Station, Explorer Motel, Alpine View Motel, Fiordland Expeditions, Around the Basin, Lakestone Lodge, Alpine Adventures, Ferris Road Brewery, Highland Bike Hire, Wanahaka, Mt Rosa Wines, Taste & Savour, and many more! “I have found the Tourism Business Success programme invaluable, both personally as well as for our Agri-Tourism business. It is a course that I would highly recommend for anyone that is wanting to upskill themselves, build on their business (or business idea in its infancy) or indeed, take their business to the next level. The Strategic Planning Day at the start of the programme had an excellent outline for how to go about structuring your business, planning and building blocks for where to start and how to move forward- with practical, relevant activities that would benefit any business. In addition to this informative and beneficial planning day, the support afterwards that is provided by Marijke, both through one on one consultations as well as the email contact and webinars that follow, is exceptional and far exceeds expectations. The resources on the www.planit-doit.com website that are provided and made accessible for the participants throughout the duration of the Tourism Business Success Programme are outstanding. Judith McMillan - www.chaletqueenstown.co.nz - Chalet Queenstown, Historic Stone House Boutique Apartments and The Paddock Straw Bale Luxury Holiday House. "I approached SMARTraining because I wanted contemporary marketing knowledge to apply to our accommodation business. I was aware knowledge I had acquired many years ago was becoming redundant in this fast changing marketplace. SMARTraining, particularly Marijke Dunselman, helped me through the Accelerated Marketing for Success programme. The programme broad and the accelerated pace of the program was very beneficial. From this program I have established a number of new habits for the business, redesigned our websites being much clearer of the unique and special offerings our business has and have extended the network through which bookings reach us. 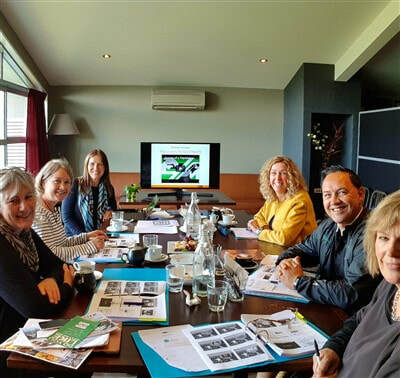 I like the way Marijke used adult learning techniques, using our experiences to help underscore learning, the opportunity to meet with others in small tourism aimed businesses and found the pace of the course great to make quick gains for the business. The course was great for putting structure and formality in the business and my life giving greater outcomes for both, for contemporising the businesses marketing approach and gave me a great “to do” list which I am still working through. I recommend SMARTraining and Marijke to people who need to commence or reenergise their marketing efforts in tourism related ventures." "Signing up and completing the Marketing for Success programme has been a turning point in our business! It has given me the tools to market Trips & Tramps with confidence and take the business forward. Marketing our business is now a priority and we have been reaping the rewards with growth in our business. Now rather than avoiding the marketing, I am confident of what I am doing, to the extend I now actually enjoy it! The emphasis on planning has been invaluable to me personally too, as it ensures I get my set tasks done in a timely manner. With 4 active children and the business it can sometimes juggle to fit everything into a day, but now with a bit of planning we have more balance in our lives. I would definitely recommend this course to anyone who is ready to take their business to the next step. Marijke has incredible knowledge of marketing tourism products and competing the course is very motivating. I have just registered for the Advanced Marketing for Success Programme!" "Five months into the Marketing for Success Programme and I have achieved some things that I have been trying to work out how to do for years! Having a chance to discuss ideas with others with similar goals is invaluable and you find that, even though the participating businesses are different - we actually all have many goals in common, and therefore similar hurdles to overcome. Often someone in the group has already trialled and erred and worked out the best solution. Marijke has the knowledge and experience to understand an idea, offer her opinion on it if you ask, and then help set achievable goals to execute the idea. She is able to show us examples of different marketing strategies that she has used for various projects and illustrate why they have or haven't worked. It feels like the content is all taken from her own work, rather than a presentation of information gathered from others. This makes it easy to respect and value her ideas. Marijke is an excellent presenter. The environment is non threatening and inviting, discussion is encouraged and ideas flow freely. I look forward to the monthly workshops which start with a review of what has been achieved by members of the group that month- a clever motivational tool! The 12 month course is well worth the investment if you are wanting to set, prioritise and achieve both business and personal goals. I would recommend it to anyone making decisions in the huge, and sometimes very confusing world of marketing." "I started attending the Marketing for Success Programme in January and have found this a really positive experience. As well as meeting like-minded people it is also a great environment to discuss ideas and new ways to promote and build your business. Each session is informative and productive and having the encouragement of the group and Marijke it keeps you on task with making sure you achieve the goals that you set at the start. I would have no hesitation in recommending this programme and think it is really valuable to anyone in a marketing role." "This programme has been beneficial on many levels - the small groups that allow people to connect and share ideas and information, the content of the course is very diverse and this is great as it cover the many facets involved in marketing a business in an ever-changing world. But the best thing is the on-going monthly meetings that not only cover new topics, but ensure follow up and accountability to keep you on task with going forward, in a positive, encouraging and fun manner in order to get successful results!" "I have found the Marketing for Success Course brilliant for motivating me to finish a task started and has given me great insight into other avenues of profiling our product, thinking outside of the basic box. Also the networking and problem solving sessions have been invaluable. Totally worth the value and time." "Radford’s Lakeview Motel has utilized the services of Strategies Marketing over the past four years. The advice and practical skills given has significantly enhanced our business during the recession to the point our business actually grew through some of the tough times. Because of my past experience with Marijke, I felt I could benefit from her new programme - ” Marketing for Success” it has been invaluable to me personally and to the way I operate my business. I have been able to immediately and successfully apply what I have learnt. Attending the monthly course over the year has enabled us to keep focused and be accountable to action our action plans on a monthly basis. "Venture Southland has contracted with Strategies Marketing Consultancy over the past 15 years to provide training workshops and coaching for the New Zealand Trade and Enterprise's Enterprise Training Programme and Business Capability Voucher Scheme, taking advantage if their expertise in both marketing and tourism. As the Regional Partner for Southland, we would like to recommend Strategies Marketing Consultancy as an approved Provider for the Capability Development Voucher Scheme." Carlyn McLintock of Highview Apartments, Queenstown, attended the Tourism Marketing Bootcamp and the E-Marketing Bootcamp and has also received one-to-one marketing coaching. overwhelmed at the response it is getting since putting it into action. Marijke has been my guardian angel with so many projects now including getting ready for TRENZ. Without her fantastic guidance I wouldn’t have been able to make business contacts with half of the people we did or the courage. recommended her to so many of my friends and colleagues." Michelle attended the "Tourism Marketing Bootcamp"
step back and take a look at the BIG PICTURE. I have come away feeling refreshed, motivated and focused on my action plan. It is also reassuring to know that the marketing challenges we face are similar to others in the industry but there are heaps of practical steps we can take to turn these into opportunities. Thanks Marijke!" Blake and Diana Holden of Break One Target Sports attended the Tourism Marketing Bootcamp. "A very informative and up to date workshop that encouraged me to fully look at, and provided fantastic ideas for, all aspects of marketing in growing my business. It was particularly relevant due to its tourism focus." Jan attended the "Tourism Marketing Bootcamp"
“A ten hour Bootcamp on marketing seemed a daunting prospect for me as a new tourist venture operator with no previous knowledge of the trade but I believe it was the best move I could have made for our marketing campaign and excellent value for money. bootcamp participants was also invaluable. Arthur attended the "Tourism Marketing Bootcamp"
the day really helped to bring together a lot of the threads of ideas I've had, but have never been able to action or given proper thought to. One of the great things I've taken away is that most of what you covered doesn't actually "cost" a business a lot of money. The investment is time to research and develop these ideas..."
"We recently attended the 10 hour Marketing Bootcamp and we are happy to say our expectations of the day were exceeded. We felt the material covered relevant issues and topics as well as raising awareness of others. The material was delivered in an easy to understand manner and the smaller group meant there was time for discussion and questions. The setting was comfortable, spacious and Marijke had gone to some effort with refreshments which was appreciated. We came away from the extremely productive 10 hour day feeling it had flown by. We now have a clear idea of who our market is, how we should be targeting them and a clear action plan to follow to achieve our objectives. The day helped clear away confusion and simplified our marketing decision making process. It was an investment in time and money that in the long run will save us the same ten times over." Anita attended the "Tourism Marketing Bootcamp"
"Fantastic day, many thanks. Definitely an advantage in refocusing our marketing efforts and putting together a comprehensive marketing plan." "This was a day very worthwhile attending for a new person in the industry. Marijke had a very well organised programme and the 10 hour session was interesting and informative the whole way through. The day has been of great value to us as we look ahead to our marketing and advertising programme." understand other businesses we work with in the region. "Opportunity to stop outside work routine and think about marketing. Excellent to form a marketing plan and learn marketing gems that would otherwise be difficult to find or expensive to obtain." "Marijke is a great presenter of the programmes and workshops. She uses a logical pattern of format and thinking which clarifies and reduces the professional mystique of marketing, so that it is easy to follow and implement. She stimulates and supports you as an individual, rekindling your enthusiasm. Highly recommended to all." "Excellent access to information that has been easy to implement instantly. I've been able to take several points away from each workshop to use - wholesaler info, packaging, press release, website. Lots of personalised ideas through feedback from others in the class which is really nice to get!." "The workshops have been superb for filling in the gaps and developing improved marketing systems for our company. The complete course has been very well put together and presented. Marketing has been superbly covered." "Motivation! Great & easy to apply advice - very practical. Especially focused towards to area and size of businesses (it wasn't geared to too broad a spectrum). Very personable. We did a new brochure & website and many ideas were drawn directly from these workshops. Thank you! Also was a great forum for networking." "I always walk out of one of Marijke's workshops with a new, practical idea of how to improve our marketing. I get remotivated!" "Having just completed the 5 stage Advanced Marketing Training Programme, they were the most comprehensive and all encompassing I have attended. Marijke really gets you to look at your marketing from all angles and presents different avenues you probably hadn't thought of. Her national and international marketing experience and contacts are priceless." succinctly and simply presented. Plentiful, relevant & expert examples utilised. setting. Well worth attending. Thank you Marijke." all but one of my actions so far." Karen has attended several of our marketing workshops. all aspects of Marketing and Advertising for Small Business within the Tourism Industry. Her knowledge of this subject and its specific application to a diverse range of individual tourism - based businesses has been not only specific, very comprehensive but totally MIND BOGGLING !!! Marijke's professional advice and assistance to us in this process has included setting up the internal infrastructure for marketing & advertising, market identifying & targeting, sources & resources available for implementing these plans, image projection & enhancement of the business assets and much, much more !! Marijke's professionalism and comprehensive knowledge are an invaluable asset to NZ's Tourism Industry and Tourism operators. "